I am caught in the making of this year’s Martisoare along with a few other projects which are in different stages of development so I don’t know when I will have something new to show you. But, because I promised myself that I won’t neglect my blog and I will post more often than I did before, I took a little break from my current projects and managed to finish canvas number 6 from the “Back to the Basics” series. Unfortunately, these past few days have been cloudy and rainy and only today I managed to take a few pictures. The canvas measures 12cm*12cm. I used Freehand521 BT font, which I modified a little bit. I contoured the letters with 5mm wide paper strips, 160gsm. 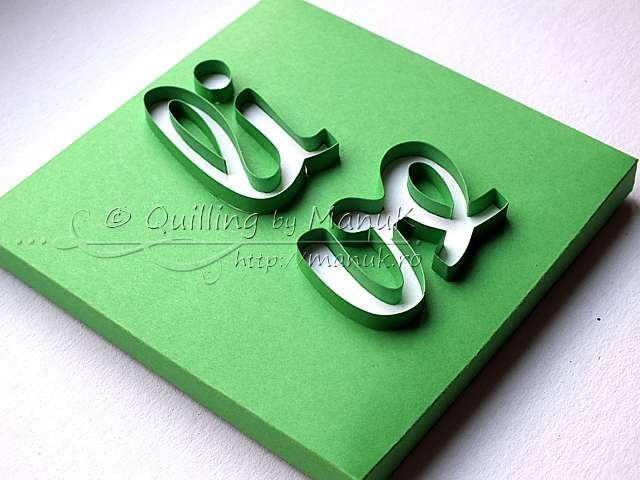 And one more thing, just in case you’ve missed it: Ann Martin featured my “love” and “Thank you!” quillography and my quilled poppy on her blog, All Things Paper. You can read about it here. Thank you so much Ann, it’s a real honor! You might think, but no, no “laugh” because I am doing only 4 letter words. I have ideas for 2 more canvases which I’ll post soon and I think the basic quillography series will end there. I hope we’ll meet some day, too, I would really love that! Como a arte que faz é fantástica, só posso dizer simplesmente :…Aaaaadoooroo!!! Muito obrigada pela simpatia e, dar a conhecer ao mundo a pessoa bonita que é.